If werewolves are Furry, then so are centaurs, satyrs, fauns, silenoi, and the other human/animal hybrids of Greek mythology. Aside from the fantasy of all the mythologicals and humans living together, this is a good historical tale of life in Greece at the time of Philip II and his son, Alexander III the Great of Macedonia. Alexander is offstage conquering the world, and there is peace in the interior of his empire. Aristotle, Alexander’s tutor, has his Lyceum in Athens, but in this year he has been summoned back to Macedonia for the summer. Without him, the other teachers at the Lyceum suggest that the students spend a few months wandering through Greece to collect odd plants and local tales, to bring back when Aristotle will return in the winter. 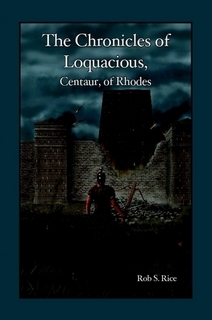 This book contains eight tales, the first five told by the student Loquacious, a centaur from the island city-state of Rhodes, to the peasants and villagers who give him hospitality, or told to him by them; and the last three later in Loquacious’ life. Esterhazy Press/Lulu.com, October 2012, trade paperback $14.95 (177 [+ 2] pages; on Amazon). Greece bans all electronic games! The headline should really be "Governments are @#$%&#ing stupid!" Since the Grecian government admitted they cannot tell the difference between innocuous video games and illegal gambling machines, they've banned ALL games played on an electronic device. Though the headline makes it sound like just violent shoot-em-up games are banned, any game is included.This means internet chess. This means Minesweeper on your Windows. Hell, I wouldn't be surprised if MUCKs might be a borderline game. Major fines are being levied against any person, tourist or local, caught playing an electronic game or even simply owning the software or console to play one.